With LibGuides CMS, you can relax knowing that content creators can build guides and curate knowledge while ensuring that they aren't publishing content willy-nilly. 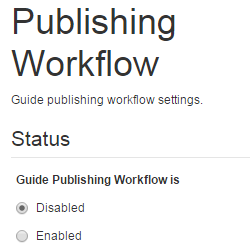 Enabling Publishing Workflows routes *all* content through an approval process ensuring that only designated reviewers can publish content. Designated reviewers receive an email notification of guides submitted for review as well as a custom 'alerts' area on their LibGuides CMS dashboards. 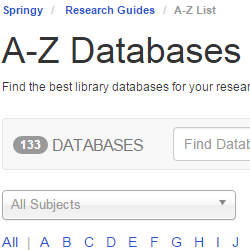 Managing and displaying your A-Z subscription resources are a breeze with LibGuides CMS. If you're a Serials Solutions client, import your databases using our one-click integration tool. 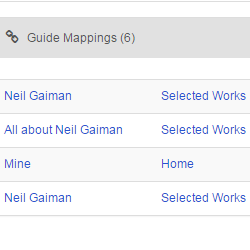 Not a Serials Soltutions subscribers, we've got you covered with our import template. Tag databases with customizable subject, vendor, and type categories to increase findability. Make databases friendlier and easy to remember by assigning friendly URL that route through your authentication layer. Replace your A-Z page with our dedicated and customizable A-Z page, complete with robust search and filtering options. Managing assets in most CMS systems can be a nightmare. A URL changes and now you're combing through 800+ pages to update it. 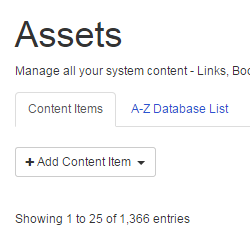 With LibGuides CMS, you can manage all your assets in one place. Globally update Links, RSS feeds, Documents & Files, and even Widgets from one area. A seperately managed assets area also let's you do what you do best - create a centralized content curation repository. You're always finding interesting websites, helpful books, and cool Podcast feeds. Store in your assets area for easy use when you're ready. There's a good chance that you're going to reuse content over and over again in your CMS system. LibGuides CMS mapping technology allows you to reuse content over and over again - while keeping them connected. Update it once and it dynamically updates everywhere it's reused. With LibGuides CMS, build it once and easily reuse it over and over.